There was real purpose behind every stroke of the lacrosse sticks on two Fairfield schools' playing fields Saturday -- the obvious attempt to score in a competitive tournament and, more importantly, the intent to honor military personnel who willingly put their lives on the line to preserve American freedom. The 5th annual Sticks for Soldiers tourney attracted a record number of lacrosse teams from around the state and raised a record amount of money, which this year benefits Brendan Marrocco, a 23-year-old U.S. Army specialist from New York, who lost his arms and legs in an explosion in Iraq. As the players ran across the fields at Fairfield Ludlowe High School and Roger Ludlowe Middle School, Marrocco continued his rehabilitation at Walter Reed Army Medical Center in Washington, D.C. Alex Marrocco, Brendan's father, said his son has been at Walter Reed since three days after the Easter Sunday morning, April 12, 2009, explosion that claimed the life of one soldier and ripped apart his son's limbs. "He's had 17 surgeries in 19 months, the latest one in mid-September was on his right leg to remove abnormal bone growth to help him walk better and with less pain," Alex Marrocco said Saturday. Brendan Marrocco has been fitted with two state-of-the-art prosthetic legs and artificial arms -- one is a rubberized myoelectric with a hand that responds to muscle impulses, the other is a hook. Alex Marrocco thanked the lacrosse players from 25 teams for supporting his son, but reminded them, "Brendan is only one of thousands. If you go down to Walter Reed you'll see hundreds of Brendans ... There will always be another Brendan." Mike Voucas, the founder and chairman of the Sticks for Soldiers tournament visited Brendan at Walter Reed last Monday. "It solidified, validated what we're doing. He energizes you. He's an amazing young man," Voucas said. "If you watch the videos of Brendan he's really upbeat and optimistic. 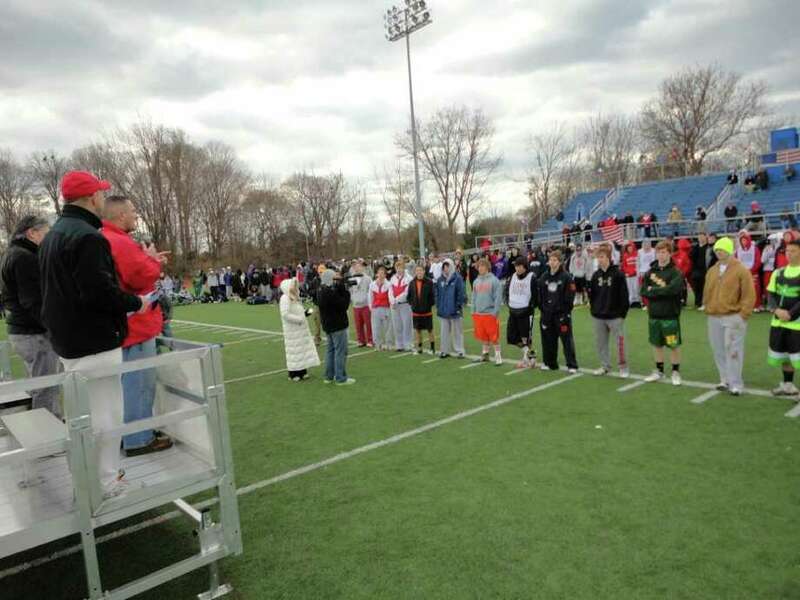 It's empowering," said Andrew Scoville, 17, a member of the Fairfield Ludlowe lacrosse team, which sponsors the event. "I'm excited to be a part of this," he said. Nate Ryan, 18, who also plays on the Ludlowe team, said Marrocco is an inspiration, and he noted the pride he has in his team and community for raising support for the troops and funds for injured troops. The money they raise, which totaled more than $30,000 going into Saturday's event, will help build a wheelchair-accessible home for Marrocco on Staten Island. "He has one goal in mind and that goal is to live an independent life," Alex Marrocco told the crowd of players, parents and other supporters of the cause. "He supported you and now you're supporting him," said Lt. Col. Tom Armas of Fairfield, a member of the 25th Marine Reserves Regiment in Fort Devens in Massachusetts, who served as the day's master of ceremonies. "The month we left Iraq is the month Brendan was wounded," Armas said. Armas thanked the lacrosse players for their participation in the event. "You're not playing for a title. You're not playing for a trophy," but rather, he said, they were playing to provide financial and emotional support that will allow Brendan Marrocco to live his life and concentrate on healing. "We want to show our support and do whatever we can to make it easy for them," said Michael Seelye, 16, of Darien, a member of the Fairfield Prep lacrosse team. There was a brief ceremony half-way through the event, at which the Fairfield Police Department marshalled a color guard and First Selectman Kenneth Flatto offered a proclamation. The male lacrosse players were not the only ones raising money for the cause. "We sold bracelets to raise money for Sticks for Soldiers," said Allison Laruew, 14, a freshman at Ludlowe and member of the girls' lacrosse team. Between the event itself, the silent auction, raffle and sale of T-shirts, organizers expect to raise about $50,000, more than was raised in the first four years of the event combined, which amounts in total $44,000. Donations for Specialist Marrocco can be sent to Tom Mason, c/o Fairfield Ludlowe High School, 134 Old Orchard Park, Fairfield CT, 06824. To learn more about Brendan Marrocco, check his website, www.brendanmarrocco.org.